As I was digging out from the snow storm today, I thought about how many times I had to dig myself out in my spiritual life. First lets look at the snow itself then relate it to our spiritual lives. One snowflake has no impact and it even can go unnoticed but as the flakes continue to come down they start to make that impact on our lives. It is when they start to pile up that we take notice and our lives start to change. We have to alter our plans because of the snow and even cancel things at times. 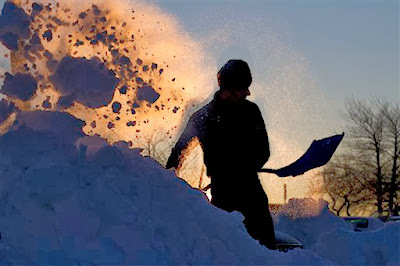 We have to become reliant on others to help clear the snow, so we can get back to our daily lives. Without that extra help we will only get so far and in the case of snow it may just be to the end of our driveways or the street. Some people wait till the snow has stopped before making any attempt to clear it , while others keep going out and clean as it comes down. If it is a minor amount the first plan is great but if there are multiple inches then the second way is best. By doing it that way, you are able to attain the goal without much effort as you go along. Yet, if you wait, you are faced with more effort to move the great chunks that have become ice and it is a greater amount to contend with. Ok, so how does this have anything to do with spiritual life? Think of the snowflakes as sin and think how sin can pile up on us and bury us. How do we dig ourselves out of sin? As Catholics we are blessed to have the Sacrament of Reconciliation. This is the first way we can start digging out. We are human and will sin, that is part of the life we have to face here on earth. So, we really can not wait till the storm of sin ends to dig ourselves out. Many other form of Christianity seem to use this idea and practice. I will address that later on in this blog. The first thing to do is to acknowledge our sins. That is when we examine our conscience. Not many people do this. If for example you never look outside or listen to reports, you will never will know if it snowed or not or how much there is. You will think that all your plans you had for the day is set and ready. But then you walk out and see the reality of it that there is so much snow (sin) that your plans are going to be delayed longer (purgatory) and you will arrive later (heaven) or even your plans are canceled (hell). We can change this by going to confession and examining our conscience. Remember I said before that some people wait for snow to stop or slow up and others will clear every so often? They both get the job done and there is that clear path. So, it comes down to how you want to deal with the snow (sins). Some will wait for the Penance Services around Lent or Advent and others will go a few times during the year. You also will have that combination of both. When sin is great in your life, you will go to confession for that time but under normal conditions will wait till those special times to go. The goals are the same. When we clear the paths to the car and clean it off and dig the car out so we can get going, this part I consider the part of examining our consciences. This is where the differences between being Catholic and many other denominations of Christianity appear. You see, as Catholics we know we need that extra help when it comes to our sins. We need that Priest who is “Persona Christi” (in the person of Christ) to absolve us of our sins. This is where I say we can only get so far on the road to heaven alone. In the case of the analogy of the snow, we will get to the end of our driveway or the street unless the plowman (Priest) clears the roads for us. We can not continue on no matter how clear that path is to our car or how clean our car is or how clean that driveway is. The snow (sin) will hinder us and can even stop us by getting stuck. Yet, the plow (Priest) can clear the way and aid us in our journey to heaven. We can manage better knowing that the road ahead is clear. Priests aid us in our journey and help us clear those paths. I do not know why other would take that chance and go out on the unsafe road without the aid of confession and the Priest. I know and can speak from experience that there was a time I felt I could go out onto the road and would be fine. That I did not need any help and I talked to God myself and that was all I needed. Well, I can say it didn’t work and all I did was travel and lost the road I was on and ended up in a ditch. Without the road being cleared, I did not see any difference between the road and the ditch. There was no distinction in my life. It all seemed the same and of course I knew best. This is one of the reasons why I respect those who become Priests. Without their help in removing those sins that block me and cause me to go off the road, I would still be in that ditch waiting for eternity, and I do not mean eternity in heaven either. We are blessed to have Confession and I hope that in some way I helped in showing how important of a Sacrament it is and that we should use it as often to keep that road clear before us. Our souls are in need of forgiveness that only a Priest as “Persona Christi” can forgive. Until tomorrow, God Bless, and may we all seek forgiveness and offer it also.